Looking for possible privately-funded rail projects, I have come across the Ringwood Branch Line on Wikipedia. 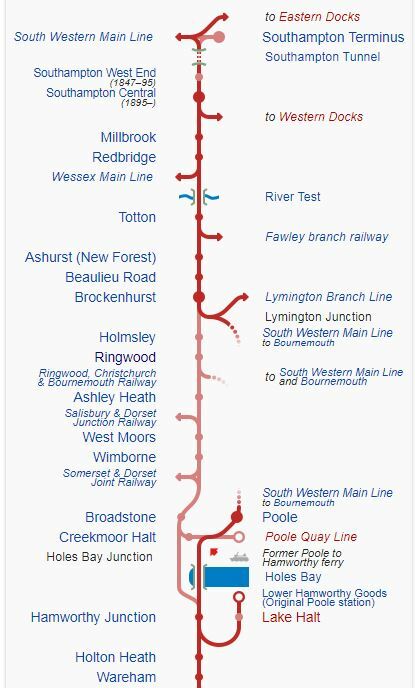 It would appear that the plan is to open a section of the Southampton to Dorchester Railway from Lymington Junction to a new Ringwood station. This is said in Wikipedia. A report from the Association of Train Operating Companies (ATOC) published in June 2009 recommended the rebuilding of part of the line from Brockenhurst to Ringwood. It looked into the feasibility of reopening disused lines and stations, and concluded that there was a business case for investing £70m in the new link with an hourly service. This diagram from Wikipedia, shows the lines in the area. Would any other stations be reopened? The line was all double-track. I’ve flown my helicopter from Brockenhurst to Ringwood and you can clearly see the old track-bed. This Google Map shows a portion of the route. The route runs in a curve between Byrbush Car Park in the West and Holmsley Station Tea Rooms in the East. Earlier, I quoted that ATOC have suggested an hourly service. Would this be one of the following? A shuttle between Ringwood and Brockenhurst like the Lymington Branch Line, which also starts at Brockenhurst. A through train to London. A through train to Southampton. Given the number of active and proposed routes in the area, there willprobably be better ideas. Great to read about this as I enjoy visiting Ringwood but have only been able to do so by car, so this would make the attractive market town much more accessible. From your comment, I suspect that’s one of the reasons ATOC want the line reopened. It was wrong to close this line all those years ago.I would dearly love to see this reopen in my lifetime,but I am not too sure if this will ever happen.Should have been kept as a preserved steam line from Ringwood through to Brockenhurst.What a great ride on a steam train that would have been. Having met Adrian Shooter and heard and read about his ambitions for his Class 230 trains, I wouldn’t be surprised if I heard that some of the excellent battery versions ended up on this route. I’ve ridden in a battery 230 train and they are a professsionally produced low-cost commuter or shuttle train for a route like this.